Eager to gain access to RESOLVE’s membership, Big Pharma, along with ASRM, have each made large cash infusions in the form of sponsorships and events. RESOLVE has since become a lobbying group for the industry. 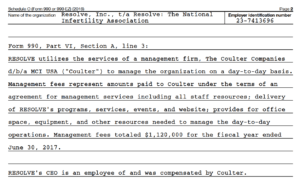 Its well-compensated executive team gets paid by Coulter Companies, now MCI USA according to RESOLVE’s latest tax filings. 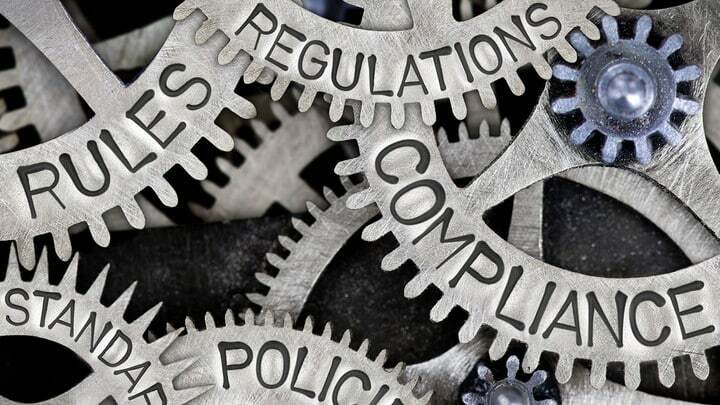 The industry-funded team works alongside its corporate council, donors and advocates — a who’s who of IVF clinic owners and service providers — to mobilize consumers to do its bidding: lobby to get insurance companies to compensate the industry for dispensing IVF cycles. It opens up a large untapped revenue stream. 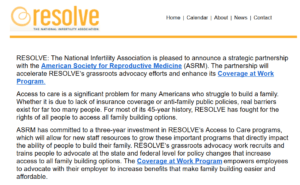 “ASRM has committed to a three-year investment in RESOLVE’s Access to Care programs, which will allow for new staff resources to grow these important programs that directly impact the ability of people to build their family. RESOLVE’s grassroots advocacy work recruits and trains people to advocate at the state and federal level for policy changes that increase access to all family building options. The Coverage at Work Program empowers employees to advocate with their employer to increase benefits that make family building easier and affordable. IVF industry marketers and clinic operators have long sought ways to grow into new markets and increase the number of IVF cycles sold. There’s a reason for this. IVF industry insiders like Dr. Samuel Thatcher and Dr. Robert Winston explain. “Program growth depends on the number of attempts, not pregnancy rate,” Dr. Thatcher wrote. Dr. Winston, who has decried the IVF industry for conning patients, has more recently criticized the growing use of experimental IVF techniques. He points out there is little to no evidence for these techniques yet they’re used by private clinics trying to enhance their success rates. The reproductive medicine industry in the U.S. sorely needs independent and outside oversight. It is one of the least-regulated of all medical specialties. ASRM self-regulates like Boeing self-certifies its jets. Catastrophic failures can and do occur when for-profit companies and industries self-police. Worse still is when industries co-opt and morph patient advocacy groups into their own lobbyists. This is a clear example of an industry seeking to grow its bottom line at consumer and taxpayer expense. I’m not surprised that this is where Resolve has gone. I found them to be a bogus organization, pushing fertility treatment at all costs. Nonprofits need to get their money from somewhere, the fertility industry is happy to oblige, in exchange for a stream of willing victims, I, I mean customers.